Located in the heart of Sichuan province, Chengdu is home to one of China’s — and the world’s — best-loved mammals: the panda. This city is not only the best place to interact with pandas, it is also a cultural melting pot with a fantastic food scene that holds a UNESCO seal of approval. The infusion of Tibetan and Mongolian influences means that Chengdu cuisine is a uniquely satisfying experience, with its lip numbing spice and infamous flavor combinations. 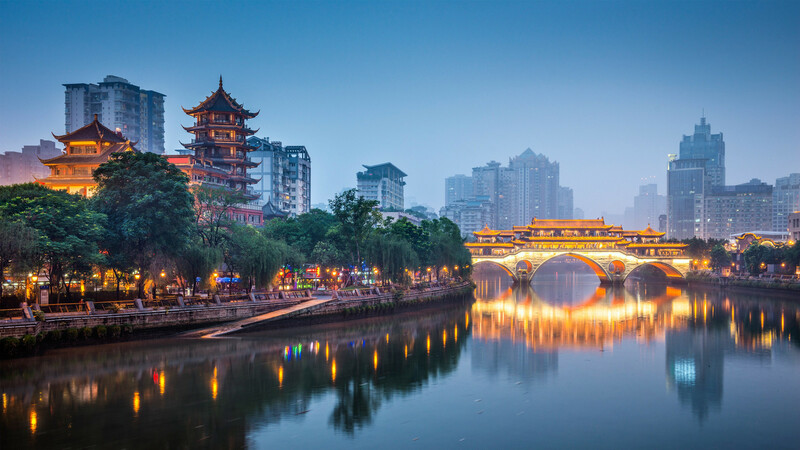 The gateway to the far west and south, Chengdu is the perfect destination for onward travel, yet the city’s laid-back pace makes it the perfect place to stop and relax in one of the many beautiful parks or traditional teahouses. Chengdu is located in Sichuan province in southwest China. Chengdu is home to the region's largest airport, with internal flights to all major cities in China as well as many international destinations. The railway station is also the best connected in the southwest, with both high-speed rail and overnight sleeper trains available to multiple destinations. Flights: You can reach Chengdu from Beijing, Guangzhou, and Shanghai by direct flight in around 3 hours. You can also travel from Chengdu to Lhasa in roughly 2 hours 30 minutes. Chengdu Shuangliu Airport is located 16 km southwest of downtown. Trains: The city has three main railway stations: Chengdu Railway Station, Chengdu East Station, and Chengdu South Station. Located about 5km from the city center, Chengdu Railway Station is the city’s main station and is a hub for ordinary (including overnight sleeper) trains to Beijing, Shanghai, Wuhan, Hangzhou, Kunming, and Guilin. The station is also served by high-speed trains to Shanghai and Chongqing. The East station, around 10km from the city center, is the hub for high-speed trains to Shanghai, Hangzhou, Wuhan, Nanjing, Nanchang, and Zhengzhou. 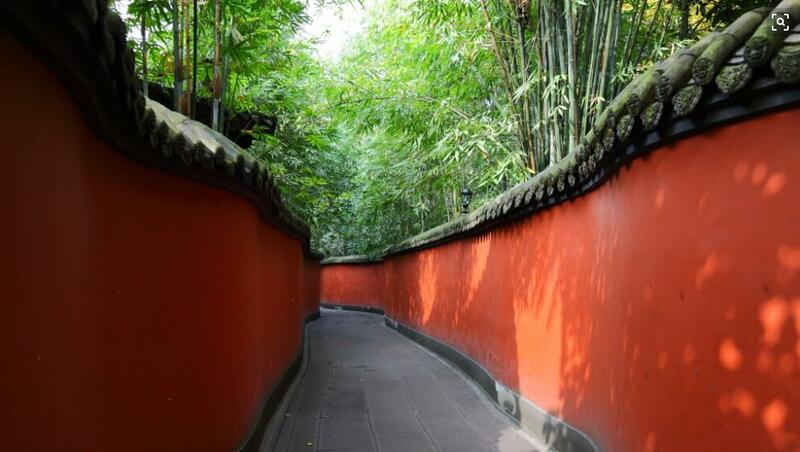 Founded in 316 BC, Chengdu holds a key role in China's history. During the Song Dynasty, the city was the birthplace of paper money. Influenced throughout its long history by Tibetan and Mongolian cultures, the city's intriguing past has left its mark on the food and local dialect, and is evidenced in its museums, temples, and fascinating archaeological sites. From the recently discovered Sanxingdui site to Wenshu Temple, Chengdu has something for everyone. A quick stop in one of the city’s many relaxing teahouses is a must on any trip to Sichuan. Most important of all, one cannot forget Chengdu’s most famous residents: the giant and red pandas! Chengdu’s tourist bus hub is Xinnanmen (a.k.a. The Tourism Transport Centre). Buses are easy to navigate; the stops are listed in both Chinese and English. This is also a four-line subway system with stops near most points of interest. 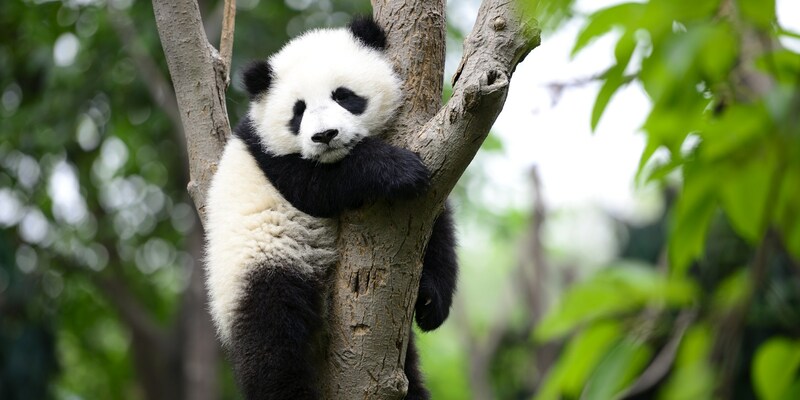 Chengdu Giant Panda Breeding Research Base: Chengdu’s furry inhabitants can be visited around 20km north of the city center at the Chengdu research base of Giant Panda Breeding. The highlight of any trip to the city and the main reason many visit, the sanctuary offers a fairly hands-on experience. Visitors are able to act like a keeper for a day, preparing food for, and feeding and interacting with, these adorable bears (make sure to wear practical clothes that you don’t mind getting dirty!) Tourist bus 902 runs regularly to and from the sanctuary and entry will cost 58 CNY. Sanxingdui: Top of the Chengdu sightseeing list for any history buff has to be Sanxingdui (literally “Three Star Mound”). Located around two hours north of the city by bus, this is a site of great archaeological interest; some Chinese archaeologists believe it is a more important find that the Terracotta Warriors. Dating back over 4,000 years, the site revealed a previously unknown Bronze Age culture that existed outside of the Shang Dynasty, challenging the traditional narrative of Chinese civilization. The beautifully intricate and unique bronze masks and busts represent the human race in a sophisticated way not previously seen in this era of Chinese history. Catch a direct bus here from Xinnanmen. Tomb of Wang Jian: If you want to see more of the area’s rich history, visit the Tomb of Wang Jian. Unlike other tombs that have been previously discovered, the resting place of this general who rose through the ranks to become emperor of the Shu Kingdom is situated above ground, giving the chamber a spine-tingling eeriness. The statue of Wang Jian that is situated within the mausoleum is said to be the only one in existence that gives a realistic depiction of an ancient Chinese monarch. Entrance to the tomb costs roughly 20 CNY. Temples: There are several beautiful temples within the city. Wenshu Temple is Chengdu’s largest and best preserved Buddhist monastery dating to the Tang dynasty; Green Ram Temple is a Taoist Temple housing a statue of a lucky bronze goat, as well as a spectacular eight-sided pagoda; and Wuhou Temple is beautifully situated in Nanjiao Park. Admission to most temples costs between 5-20 CNY. Tourist Bus 901 will take you from Wuhou Temple to People’s Park and Bus 81 stops at the Green Ram Temple. Parks: Parks are central to Chengdu’s unique culture and way of life. While visiting People’s Park, the city’s main park, you will often catch locals practicing the stately martial art of Tai Chi. You will also find a number of relaxing teahouses. Alternatively, both River Viewing Pavilion Park and Du Fu’s cottage are a combination of park and museum, honoring the Tang dynasty poets Xue Tao and Du Fu. Bifengxia Panda Base: Those with longer to spend in the area — and who are perhaps interested in spending more time with the lovable pandas — should plan a trip to Bifengxia Panda Base. The Base offers volunteering programs and the site is home to an adorable panda kindergarten. The base is close enough to Chengdu that you can just spend a day, although you can also stay in the park. For those fond of hiking, the park has a few trails. Take a bus from the Xinnanmen and change onto the minibuses that serve the base just before Luyou Chezhan. Nature and hiking: If you want to go hiking, a visit to Mount Emei should be at the top of your list. Mount Emei is one of China’s four sacred Buddhist Mountains and the stunning scenery, coupled with the potential of sleeping in one of several beautiful monasteries in the area, make it a worthwhile trip for anyone — not just those who are more inclined towards outdoor activities. There are several possible routes on the mountain varying from one day to three (depending on how extensively you use the buses and cable cars available). Mount Emei itself is a bus ride from Baoguo (the gateway village to the mountain). You can reach Baoguo in around 2 hours 30 minutes from Chengdu by both bus and train. If you only have limited time to spend in Chengdu prioritise a trip to see the pandas in the morning, as this is when they are most active. A visit to Sanxingdui should only take half a day. Plan your schedule around these two activities as they take you out of the city and then use your remaining time to visit the landmarks. The Jiuzhaigou region is one of the most spectacular in China, home to awe-inspiring natural wonders and Tibetan-influenced Buddhist monasteries. Jiuzhaigou airport sits atop a leveled-off mountain, so you approach at the same heights as the surrounding mountain peaks and land at an altitude of 3,448 meters (11,312 ft) above sea level. During the summer season the airport has flights directly from Beijing, Xi'an, Shanghai, Chengdu, Chongqing and Guangzhou, so it is easy to integrate it into a China tour. Note, however, that flights through this airport are not cheap. Despite being fairly in the wilderness, Jiuzhaigou does attract hordes of tourists, particularly on weekends and natural holidays. Nevertheless, the crystal clear pools, primeval forests, and stunning mountain scenery are more than worth the trip. Famous for its spectacular blue pools, the nearby UNESCO World Heritage of Huanglong valley is equally as stunning. As for accommodation we recommend the off-the-beaten-track Tibetan House International Hotel, which is three miles outside the main town and offers a unique opportunity to stay in a Tibetan home in a village. June through October are considered peak season in this area. We suggest bringing some snacks along as you will be walking a fair bit, and the shops are limited. Chuanchuan xiang: The equally spicy rival of Chongqing hot pot, chuanchuan xiang are meat and vegetable skewers cooked in a pot of hot bubbling oil. Fantastically spicy and full of flavour, the most authentic Chuanchuan vendors keep the oil bubbling all day long and customers are given fresh skewers, meaning the oil itself is what gives the dish such a rich flavor. For a list of where to find the most authentic Chengdu Hotpot click here. Hongyou chaoshou: Sichuan's take on the dumpling is usually filled with pork and ginger and served in an intensely fragrant sauce made with garlic, soy, and the province's famously fiery famous chili oil. Mapo doufu: This dish of tofu served in a spicy sauce containing pork, broad bean and chili paste (douban), and Sichuan peppercorns, though served all over the world, must be had in its birthplace in order to experience it at its best. Head to Chen Mapo Tofu to try this delicious dish. Huiguorou: For those who can't quite handle the heat of traditional Sichuan cooking, this may be the dish for you! Pork belly is first sliced and boiled in salt water, then stir-fried until beautifully crispy and served with leek and just a touch of chili. Heming Teahouse: Found in the People's Park by the lake. River Viewing Pavilion Park Teahouse: This teahouse is set among the beautiful bamboo (the park is home to 150 different varieties). Yuelai Teahouse: An ideal place to sip a cup of tea and join in on the local tradition of bǎilóngménzhèn (gossiping) whilst taking in a free Sichuan opera performance. From traditional performances of Sichuan opera to live music and bars, Chengdu's nightlife holds something for everyone. Wherever your night takes you, be sure to finish off with a late night helping of Chengdu Hotpot to clear your head! For an up to date calendar of all Chengdu’s evening happenings visit the website of local magazine gochengdoo. Shows: Teahouses are a great place to watch a Sichuan opera performance. Shufeng Yayun Teahouse hosts nightly performances of a 250-year-old traditional show, beginning at 8pm. Bars and Clubs: You will find most of Chengdu’s bars and clubs located around Blue Caribbean Plaza, Lan Kwai Fong, and the Poly Center. If you want to listen to some live music, head to New Little Bar. Climate: Visit in spring to enjoy pleasantly warm temperatures and to avoid the Summer rains. Festivals: Chengdu's annual Peach Blossom Festival runs from March to April in Longquanyi district, just a short bus ride from Xinnanmen Tourist Transport Centre, and is a stunning sight to witness. A Lantern Festival is held around the same time of year at Tazishan Park in the east of the city, with local food and acrobatics performances. XinJin dragon boat race takes place on June 9. Chengdu's transport links mean it is the perfect gateway for further explorations of Sichuan province. Travel onwards to Langzhong to catch a glimpse of "old China", visit the Giant Buddha of Leshan or head north into the captivatingly beautiful Jiuzhaigou national park, now a site of ecotourism.